WASHINGTON (Oct 30): The Federal Reserve on Wednesday ended its monthly bond purchase program and dropped a characterization of U.S. labor market slack as "significant" in a show of confidence in the economy's prospects. In a statement after a two-day meeting, the central bank largely dismissed recent financial market volatility, dimming growth in Europe and a weak inflation outlook as unlikely to undercut progress toward its unemployment and inflation goals. "On balance, a range of labor market indicators suggests that underutilization of labor resources is gradually diminishing," the Fed's policy panel said in an important departure from prior statements, which had described the slack as "significant." "The committee continues to see sufficient underlying strength in the broader economy," it said. U.S. stocks added to earlier losses after the statement but came back to close down only marginally, while the yield on the 5-year U.S. Treasury note jumped, putting it on track for its biggest one-day increase since mid-March. The yield on the benchmark 10-year U.S. Treasury note was little changed. The dollar rose to a three-week high against a broad basket of currencies as traders pulled forward expectations of when the Fed would eventually raise interest rates. Rate futures shifted to show better-than-even odds of a rate increase in September 2015; previously, they had pointed to a hike in October. The Fed has held rates near zero since December 2008 and has more than quadrupled its balanced sheet to $4.4 trillion through three separate asset purchase programs. 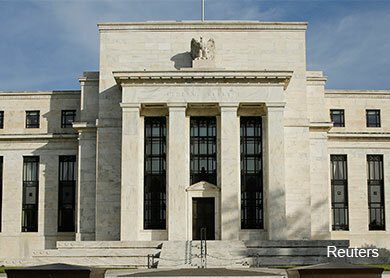 "The market is saying that the Fed has now stepped closer to tightening interest rates because of the labor market," said Andrew Wilkinson, chief market analyst at Interactive Brokers LLC in Greenwich, Connecticut. The Fed also added broad, flexible language that ties the timing and pace of any future rate hike to incoming economic data, as Fed Chair Janet Yellen has stressed in recent remarks. While the central bank retained its basic guidance that overnight borrowing costs would remain near zero for a "considerable time" following the end of bond purchases this month, the new phrase marks a turn towards a new regime. "If incoming information indicates faster progress toward the committee's employment and inflation objective than the committee now expects, then increases in the target range for the federal funds rate are likely to occur sooner than currently anticipated," the statement said. The changes in language seemed to accommodate the concerns of Fed officials worried the central bank was falling out of step with improvements in the economy. Philadelphia Fed President Charles Plosser and Dallas Fed President Richard Fisher, who dissented at the previous meeting last month, voted in favor of the statement this time. Like investors, economists generally saw the new language as having a slightly hawkish tilt, downplaying risks the recovery will ebb and sticking with the underlying forecast of moderate U.S. economic growth and steady improvement in the job market. "Despite the recent market volatility, the statement ... was, if anything, more hawkish," said Paul Ashworth of Capital Economics. "So, on balance, the Fed believes it is getting closer to meeting the full employment side of its mandate." Minneapolis Fed President Narayana Kocherlakota was the only one who broke ranks, arguing for the committee to make a bolder commitment to meet its 2 percent inflation target given a lack of price pressures. A global stock market sell-off two weeks ago, a dip in inflation expectations and flagging growth in Europe had raised the risk that global weakness could hamper the U.S. recovery and undercut the Fed's effort to move inflation higher. The Fed made only slight reference to those events. It acknowledged that lower energy prices "and other factors" were holding inflation down. But it said risks to the economy were balanced, and it repeated its view that the likelihood of inflation undershooting its target had diminished since earlier this year. The decision to shutter the bond-buying program was almost foregone. The monthly purchases had been steadily cut from $85 billion to $15 billion as part of the Fed's gradual turn away from policies launched to fight the 2007-2009 recession and breathe more life into a tepid recovery. The Fed will continue reinvesting the proceeds of securities that mature each month, meaning its balance sheet will remain intact for the time being.